Every Saturday, I host a feature called Kid Konnection -- a regular weekend feature about anything related to children's books. This week, I'm going to share with you two fun books for kids from Time For Kids. What kid doesn't like books with lists? I know I did when I was young. And if I'm being entirely honest, I still like lists -- both making them and reading them! 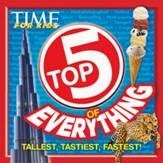 TOP 5 OF EVERYTHING: TALLEST, TASTIEST, FASTEST! by Time for Kids is a brand new addition to our home library, and we agree that it's a winner. TOP 5 OF EVERYTHING is truly a lot of fun. It's a small softcover book that provides all sorts of top 5 lists. Some of the topics included are roller coasters, sports, geography, people, and other interesting tidbits. Of course, Booking Son was drawn to the ones associated with sports, but many of the lists in this book captured his attention. 4. Quaker Oats Cap’n Crunch’s Oops! As a mother, I really enjoyed TOP 5 OF EVERYTHING. Needless to say, I learned some fun trivia about a wide assortment of things, but I also appreciated that this book will appeal to all types of readers. Not only are some of the lists just plain fun like Top 5 Halloween Costumes for Kids (there's another list for Pets! ), but there are also lists that provide educational information. For instance, there are lists for national parks, rain forests, animals, and more! I knew when I was skimming through this book that I would be reading and re-reading it with my son. By that, I mean he will read it out loud to me as he discovers some interesting facts. He just loves to share what he learns and TOP 5 OF EVERYTHING offers many minutes of learning fun! Next up is the BIG BOOK OF WHY: CRAZY, COOL, & OUTRAGEOUS! This hardcover book contains more than 1,000 fascinating facts about things kids want to know. The book is divided by subject matter and includes the human body, animals, nature, the Earth, space, science, technology, transportation, U.S. and world history, world culture, arts and media, and sports and games. BIG BOOK OF WHY was another hit in our house! It's one of those books that just geared towards kids and makes reading fun. The colors and photographs are very eye-catching, and there is a lot of information about a variety of subjects on each page. I can guarantee that even reluctant readers will want to take a peek at this book. I adored this book and consider it kind of a fun encyclopedia. The topics covered are both interesting and educational, but I also like how the information was presented. They answers to these questions are short and to-the-point, and even better, they are easy to understand. In addition to the questions and answers, the book also has some "cool" and "outrageous" facts thrown in! I can't even begin to cover the amount of information offered in BIG BOOK OF WHY, so I'll just give you a few examples of the questions. Q: Why are tropical fish so colorful? A: Scientist believe bright colors can serve as camouflage for tropical fish, and can help them attract mates. Sometimes poisonous fish use their bright colors to warn away would-be predators. Another theory is that reef fish see more colors than humans can, so they have to be colorful to be recognized. Q: Why do male lions roar? A: For lions, roaring is like talking. Different sounds can express different things. Male lions roar to claim their territory, as if to say "This place is mine!" Sometimes they roar to call lionesses. Roars can be heard for miles, which is helpful since lions often live in large, flat areas. Q: Why were U.S. soldiers called G.I.s? A: During World War II, anything the U.S. government made -- from shoes to guns to chocolate -- was known as "government issue," or "G.I." Some American soldiers played off the term and unofficially called themselves G.I.s. Later, G.I. Joe soldier dolls became one of the most popular toys in the country. I really think Time for Kids is on to something with these two books. Booking Son can't get enough of the lists, explanations, and pictures that these books offer. Highly recommended for home and school! Thanks Goodman Media International for providing review copies of these books. These are books our kids would love. They love interesting facts and stats and lists. In fact our daughter is reading the Guiness Book of World Records this weekend and is constantly telling me all kinds of interesting stuff from that book. My kids love trivia books! We especially like the National Geographic ones but these look awesome. I love books like that to this day and drive Carl crazy when I read them! All my nieces and nephews would have adored this one when they were kids ... wait! Who am I kidding? I think they'd still love them.